You dont need to know about us as you already know that we are a pair of the sexiest damn beasts on the planet doesnt matter where we are. That right my friends. A copywriter, ghostwriter and scriptwriter in Indonesia. Won some prizes. Published some writings on national media and books on publishers. 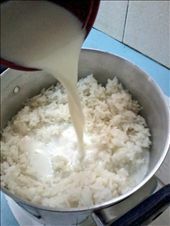 Stir in milk, salt and sugar to cooked rice. Bring to cook for 15-20 minutes.